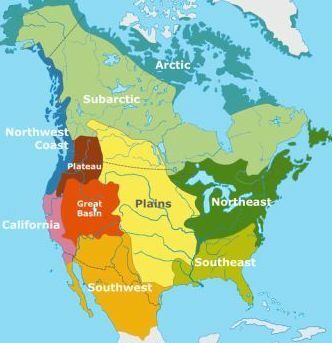 Summary and Definition: The Paiute tribe were nomadic hunter gatherers who inhabited lands occupied by the Great Basin cultural group. The Paiute tribe inhabited the Sierra Nevada Mountain Range that forms the border between present-day Nevada and California. The most famous members of the Paiute tribe was Wovoka (c. 1856�32) a Northern Paiute shaman who founded the Ghost Dance movement. The Paiute tribe lived in small family groups in small camps of grass houses or temporary wikiups. They spent most of their time gathering seeds, fishing and hunting especially for migratory ducks. The tribe used canoes to travel across the waters. The Great Basin social and cultural patterns of the Paiute tribe were those of the non-horse bands. The neighbouring tribes of the Paiute included the Koso, Washoe, Panamint, Walapi, Ute and the Shoshone tribes. The white settlers that rushing to reach the California Gold fields or the Comstock Lode silver passed through Paiute lands. Some traders and settlers decided to stay in the area, cut down trees ruining the Pine Nut forests and trampling across the grasses that had once provided the Paiute with their means to survive. In 1858, the Paiute tribe allied with the Coeur d'Alene in a 2 year war against the white invaders. After initial successes in the Pyramid Lake War of 1860, they were defeated. The Paiute tribe again came to the fore when Wovoka (c. 1856�32) a Northern Paiute shaman who founded the Ghost Dance movement. What did the Paiute tribe live? What did the Paiute tribe eat? 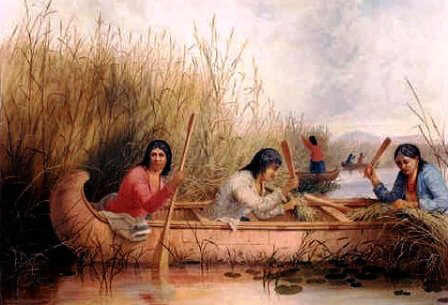 The food that the Paiute tribe ate included Indian rice grass, also known as sandgrass, Indian millet, sandrice and silkygrass. Rice grass occurs naturally on coarse, sandy soils in the arid lands throughout the Great Basin. Other common names are sandgrass, sandrice, Indian millet, and silkygrass. The seeds of rice grass were a staple food of Native American Indians, including the Paiute tribe, who lived in the Great Basin area. 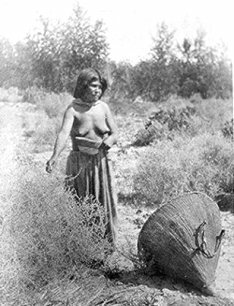 The Paiute tribe were skilled basket makers and wove their baskets so closely that they could contain the smallest of seeds and hold water. The Paiutes foraged for tubers and greens, including cattail sprouts, and for berries and pine nuts. The seeds of rice grass were ground into meal. Whenever possible they fished and hunted, especially for migratory ducks. Wikiups: The Great Basin Paiute tribe lived in temporary shelters of windbreaks in the summer or flimsy huts covered with rushes or bunches of grass called wikiups. The materials used were sagebrush, willow, branches, leaves, and grass (brush) that were available in their region. Grass Houses: The more permanent winter homes of the Paiute were grass houses consisting of cone-shaped huts that were built using a frame of willow boughs and covered with reeds, branches and grass. The Paiute grass house was rounded at the base and at the top of the dome was an open smoke hole. Rocks were piled around the base of the grass house for added insulation. Occasionally the Paiute domed grass houses were built over a 2 - 3 foot foundation. Bark and sometimes earth was added to the Paiute grass house covering to keep out the cold.